Prospectors Develop Projects to Mine Potential Bounty in Minerals. Geologists have long known that deep beneath the forbidding ice of this Arctic island lay buried treasure. Below hundreds of feet of frozen water and ground, iron, copper, nickel, zinc, rare-earth minerals and rubies beckon. Oil and gas may sit offshore. Fortune hunters taste opportunity. 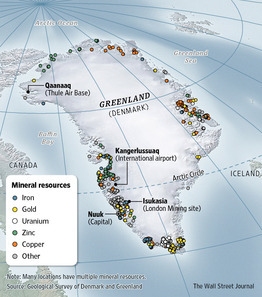 Prospectors from various countries, encouraged by Greenland's investment-friendly policies, have spent over $1.7 billion developing potential projects. A British company is going for iron ore. Scots are testing for undersea oil. Australians are pursuing rare earths. Canadians are digging for rubies, while giant Chinese mining and engineering concerns are jockeying for position. In Greenland, the Arctic is in play. Recent annual thaws make it possible for the Danish territory to contemplate exploiting these riches, even though the 56,000 people who live on the world's biggest island lack the means to build the ports, roads and power plants required to transform the fishing-based economy into a mining one. Greenland's geologists had found many resources on the largely pristine island but never much pursued mining. Then, in 2009 Denmark freed the island to largely govern itself, permitting locals to decide how best to use the land. Greenland's ethnic Inuit welcomed mineral and petroleum investors as new patrons. The islanders say they desire full independence but that it won't be possible until they achieve economic self-sufficiency from Denmark, which still provides hundreds of millions of dollars in annual support and basic services like policing. Led mainly by small Australian and Canadian companies, mining groups are currently exploring more than 100 projects. "Mining will come to Greenland," newly elected Prime Minister Aleqa Hammond declared in a recent interview with The Wall Street Journal. Because China is the biggest importer of many natural resources, its companies factor into plans for many Greenland proposals, including as customers, according to interviews with dozens of executives and government officials. 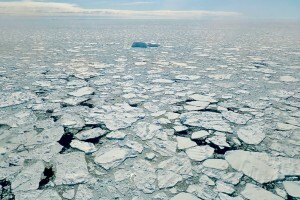 In fact, this icy frontier's future may depend significantly on China's bankers, engineers, builders and buyers—and their government's determination to win influence at the top of the world. While Denmark officially welcomes these suitors, diplomats say a significant economic tilt toward China would discomfort Denmark and its ally, the U.S.